Ubuntu 12.04: A Stairway To Heaven? Many of Linux users waited for that day, the 26th of April 2012. The day when Canonical released their Ubuntu 12.04 Precise Pangolin. The day when Unity became the only available desktop environment for the current long-term support version of Ubuntu. Let's see what it brought. Canonical stuck to the classical ISO image size this time: only 700 Mb, which is just fine to be burnt onto CD. As usual, there are several options available, either in terms of the system (32- and 64 bit, desktop and server, text-only and graphical installation), or in terms of downloading options (direct download from a mirror or using a torrent). I chose 32-bit desktop version and used torrent this time. Downloading of ISO image from the torrent was not a big problem. Initial downloading speed was low, but I guess that was an issue of the last mile, i.e. my connection to the provider. Soon that problem was resolved, and I got my own ISO image of the Ubuntu 12.04 operating system. This time the image was burnt onto the CD-R disk, because I was fulfilling orders which came via my eBay site and via Buy Linux CDs page. I usually quickly test each CD for the ability to boot and to run few programs. That's why I decided to use one of those CDs to get my own picture of Ubuntu 12.04. So, CD is in the drive of my Fujitsu-Siemens Amilo Pi 1505 laptop. Reboot. Choose to boot from optical drive. Let's go! The first screen which I saw soon after the boot was about the choice between Try Ubuntu and Install Ubuntu. Same screen features selection of available languages. If you remember, Ubuntu 12.04 is not the first Ubuntu release to feature this method of booting the Live CD image. Of course, my choice was for the Try Ubuntu option. While I am talking about the system boot, I'd like to mention that I also tried to boot my other laptop HP Compaq nc6000 with Ubuntu 12.04 CD. Unfortunately, I was not able to do so. I got an error about absence of pae support in my processor. This is now a requirement for Ubuntu. I recently got the same issue with pae when tried to install CentOS on the very same computer. It has Celeron processor of one of the first generations, which were produced without pae. Coming back to my Live run. The total boot time of Ubuntu 12.04 Live CD was significant. It was not the longest I've ever seen, but much more than I expected - about 5 minutes to the final desktop. Most of that time was spent before the Try/Install selection. 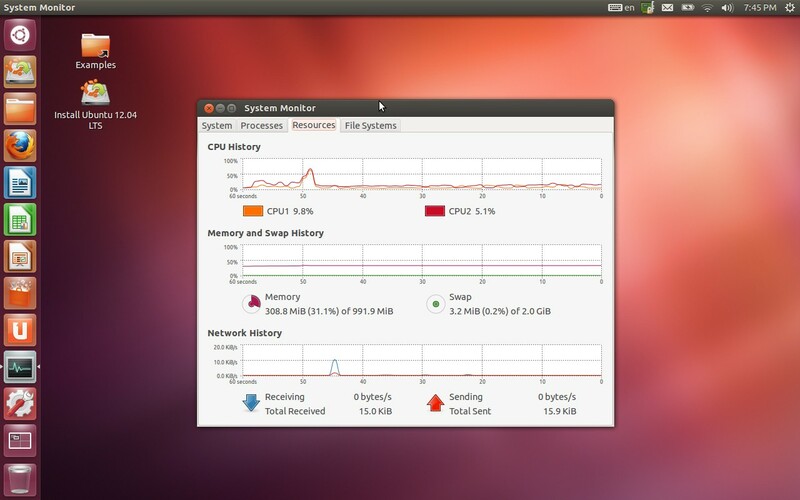 Freshly booted Ubuntu 12.04 operating system took astonishing 310 Mb of memory. That's more than I expected. The default desktop wallpaper in Ubuntu 12.04 is in very well-known to all Ubuntu users purple-and-orange colors. I would say that orange dominates this time. There is a choice of 15 alternative wallpapers, if you want to change. My own choice was for the shot of London Eye. Obviously, because I live in London. By the way, the window with the choice of wallpapers allows you to reduce the size of Launcher panel icons, down to 32 pixels, and configure auto-hide option for it. So, the functions, which were previously available via 3rd-party configuration utilities, found their way into the core distribution. As in all previous versions of Unity, there are 2 panel-type elements on the screen of Ubuntu 12.04. The left side panel, the Launcher, has some quick access application buttons on it, plus system elements like Bin, Workspace Switcher (there are 2 virtual desktops), and Dash menu button. Most of the elements can be easily locked to or unlocked from the launcher by right-clicking on the relevant button. Also, right clicking on the Unity-optimized applications gives you a choice of available actions for quick access. For example, right-click on the Nautilus file manager button allows the quick access to Home, Documents, Pictures and some other folders. The top panel in Unity has notification area at the right hand side. There you can find clocks, keyboard layout indicator, Network manager, volume control and some other elements. Separate item is a cogwheel, which gives you access to system updates, system settings, displays, printers and also to session control functions (log off - shut down - suspend). All the rest space on the top panel works as the menu bar of active application, if the application supports this. Not all the applications have this support yet, for example LibreOffice components. Also, window control elements are on the panel in the case of maximized window. Ubuntu 12.04 automatically found and configured wireless card on my Fujitsu-Siemens laptop, which is Intel 3945 ABG. I can say the same about Realtek 8191SE, which is in my other laptop - Toshiba L500-19X. A click on Network Monitor icon on the top panel brought me a list of available wireless networks, including my own. It was an easy task for me to configure security and connect to the network. I booted my Ubuntu 12.04 using English as the system language. The keyboard layout indicator with en sign on it appeared on the panel right after the boot. A click on it gave me the list of available English layouts: US (default), UK, Ghana and Cameroon. The same menu included the configuration option for the layouts. I tried to add Russian to the list, and succeeded only after some time. The problem was that "+" button on the configuration window was grayed out. I first had to remove any of the existing layouts, and only after that I could add more. I think this is a bug which developers can fix later. The hotkey configuration for the layout switching was also available on the same screen, and Ctrl-Shift combination worked well. Finally, I was able to type in both Russian and English UK. There were no issues with touchpad. Tapping and edge-scrolling were configured in the way I am used to seeing them. There is no menu in Ubuntu 12.04 as most of us used to see it in different operating systems in the last 15 or so years, at least since Windows 95. Dash menu is the place where you search and start applications. Dash itself has 5 tabs, which you can navigate through: recent applications and documents, full list of applications, documents, music and videos. These are called "lenses", and you can install more lenses if you wish to. Dash menu can be called by pressing "Super-key", which on most keyboards has Windows logo. One of the most powerful features of the Dash menu is Search. You can start typing the name of application you need, and system will show you the available ones. Unfortunately, this feature does not always work as expected. For example, search for "graph" shows irrelevant applications like Orka Screen Reader or LibreOffice Writer, but not LibreOffice Draw, which would be more logical. The same is valid for search for "internet": it does not show the Firefox browser. This is the same issue which I've seen since my very first acquaintance with Unity in Ubuntu 11.04. Other than using the search, you can limit the list of Dash items by using filters, which are context-dependent. For example, the Applications tab uses groups like Education, Internet, Games etc as filters. You can use this in analogy to menu sections in the classical menus. There is an important difference, although, from both the classical menus and from the previous versions of Unity: clicking on several filter groups enables all of them, so you can see applications in several groups at the same time. Second click deselects the filter group. Firefox 11 is the default browser in Ubuntu 12.04. Other than Firefox, there are Thunderbird mail client, Empathy IM client, Transmission bit-torrent application, Gwibbler social networking tool and some more in the Internet section of the Dash menu. I have written several times on this blog that Chrome, or Chromium, is my favourite browser. That's why I tried to install it. Installation of Google Chrome in Ubuntu 12.04 went fine from the downloaded file. But I could not locate it anywhere in the menu. I could find and start it only by navigating to /opt/Google folder. As alternative to Google Chrome, Ubuntu Software Center allows you to install Chromium browser. This requires activation of the Universe repository. Unfortunately, Chromium did not place itself into the Dash menu in my Live session. It was still shown as "Available to download", although, it automatically placed the icon onto the Launcher. So, I was able to start it from there. Limited LibreOffice suite is in the Office part of the Dash menu. It includes Draw, Writer, Calc, but does not include Base or Math. GIMP is not included into Ubuntu 12.04 either. Instead, you have LibreOffice Draw and Shotwell photo manager. As you can already see, there are many interesting applications which have been dropped from the initial distribution. I won't list all the available and unavailable applications here. I am sure there are plenty of places where you can get the list, or, better, try Ubuntu 12.04 yourself. And, of course, nothing is impossible with usage of Ubuntu repositories or PPAs (Personal Package Archives). 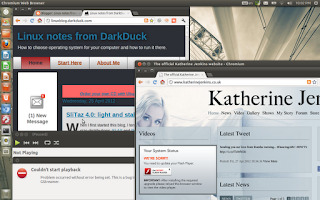 Nautilus, the default file manager in Ubuntu 12.04, includes the Browse Network section. I tried to use it to get connection to my external network drive. Unfortunately, I was not able to do so: Nautilus was not able to retrieve list of available servers. Manual mounting using the sudo mount -t cifs... command was not successful either. I had to install smbfs package in order to be able to mount the remote Samba partition. Once smbfs was installed, mounting of external partition was like a walk in the park. Ubuntu 12.04 operating system comes without any audio and video codecs on Live CD. Of course, there is an option to get them during the installation, but if you stick to Live media, then you need to download these codecs separately. In addition to problem with codecs, I found an issue with Russian filenames. An attempt to play an MP3 file with Russian characters in the name automatically started Rythmbox, the default music player in Ubuntu 12.04. But I got an error message straight away, saying that file cannot be opened. Opening the file with Latin characters brought me another error message. Flash is not included into the Ubuntu 12.04 distribution ISO either. My general feeling is that Unity, and consequently Ubuntu, grows and starts getting more and more user-friendly. In this Long-Term Support version, Canonical tried to adopt Unity for desktop and laptop users, not for touchscreen users only. But there are still lots of places where urgent improvements are required. Apart from above mentioned issue with search, I'd like to note that placing tabs switch into the lower part of Dash menu does not help usability. There are too many mouse movements required to start an application. Taking into consideration that default tab is "Recent applications and documents", it's getting too annoying to move mouse across the monitor twice: first time to switch the tab, and then to activate search, filtering or select an application. Finally, I'd like to mention that the general performance of Ubuntu 12.04 is far from ideal. Running it from the CD is painful. I understand that not very many people will run Ubuntu from Live CD. But there are still somebody who wants to try Unity and Ubuntu, or maybe just Linux for the first time in his own life. And such a speed is really killing any enthusiasm. Although, I still want to call Ubuntu 12.04 "A Stairway to Heaven". Canonical is getting higher and higher on this stairway. Of course, current stair is far from the top. But it is higher than in versions 11.10 and 11.04. 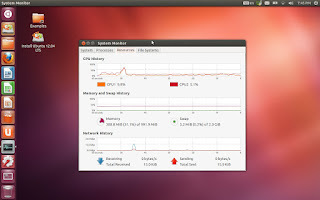 What is your opinion of Ubuntu 12.04? Is it an operating system you use, or plan to use? Can you recommend it to you friends? By the way... if you want to try Ubuntu 12.04 yourself, but can't your CD, why not order it from Buy Linux CDs site? The disk with Ubuntu, or any other Linux distribution, will be delivered right into your mailbox. LXER, Slashdot and Linux Today have all been awash with Ubuntu 12.04 articles most of them hailing it as the best thing ever. I'm glad that you have been honest with your review. I have been running Fedora 16 for the past month and I will say I'm not loving it because there are a couple of quirks especially with Yum but it runs efficiently and by and large everything works. I was tempted to try the new Ubuntu out based on the reviews on Lxer but I might perservere with Fedora a bit longer. To be honest I've downloaded a dozen distros in the past month with a view to trying a few out but Fedora has just enough to keep me using it. I don't mind the Gnome 3 shell and in fact I quite like it. I tried Unity on Ubuntu 11 before but it is still in its infancy. I am looking forward to a version of Mint with a better Mate desktop. I use Mint on my alternative laptop mainly because my daughter uses it sometimes as well and it is a testament to Mint that a 4 year old can use it quite so easily. Incidentally Dark Duck I know you review lots of distros but which ones do you actually prefer. If there was a Fedora+ distro that was Fedora without the glitches it would be great. I am using Mageia KDE, Xubuntu (currently 11.10) and Debian Squeeze GNOME. I am in Debian as I write. I tried Bodhi for the first time yesterday using unetbootin and a live usb drive. Wow. That thing zips along at quite a speed. I'm thinking that Fedora is about to be overwritten on my netbook. The CD boots slowly, but USB is faster, and an installation takes between 15 and 30 seconds. I can't believe in 15 seconds. But I'm not going to try. At least, not Ubuntu. Kubuntu and Xubuntu are more realistic candidates. 5 minutes sounds like more realistic. 'Stairway to Heaven' is an apt title. A fantasy realm, far removed from the reality and day to day needs of those of us who count on our OS and use it to pay the rent. I think somebody still likes Unity. At least, I know a couple of people. Well, I like it a lot and, having now used it, feel that there have been some really misleading 'reviews' by people whose prejudices or laziness caused them to not bother to learn about what they were reviewing. The 'reviews' were simple lists of things that did not conform to the world they were stuck in, and that's not a particularly honest thing to post as a review. I think, the best rule here: if you want to do something the best possible way, then do it yourself. If you feel yourself comfortable in Unity, then write about your experience, hints and tricks. I will be more than happy to publish this as my guest post. I find Unity much better on Ubuntu 12.04, but I find Gnome 3 superior to Unity to manage the whole PC. If you need an interface like "Gnome 2 Panels" or "Windows XP", then you need the "Gnome Session Fallback" or "Xfce" interface. 1 - install package: xfce4. 2 - on Ubuntu logon screen, select the Xfce session. 3 - you will have a Windows XP like interface with all Ubuntu Gnome standard apps, no duplicates, no Xubuntu tuned down apps. 1 - install packages: gnome-shell, gnome-session-fallback, gnome-tweak-tool. 2 - on Ubuntu logon screen, select the Gnome Classic session. 3 - you will have a Windows XP like interface with all Ubuntu Gnome standard apps. This works like on Windows 8 where you can choose the Metro interface or the Classic Windows XP interface. Why make hoops of installing XFCE4 onto Ubuntu, if you can go directly to Xubuntu? I disagree with your review. I don't think that a review based on a LiveCD is a fair assessment, especially for people that are going to be using it on a day to day basis. How many people do you know that use a LiveCD as their primary OS(s)? I'm sure it isn't many and probably not the majority. I do agree with 99% of the reviews out there over the last few days; Ubuntu 12.04 LTS is awesome, Unity has matured. Install it, give it a try and as always, have an open mind! It's a long-lasting battle. I wrote about why do I do Live system reviews. I'm not going to install Ubuntu 12.04. As I have just replied to Daniel Bo, Kubuntu and Xubuntu are more realistic candidates for installation. I read to the bottom hoping that I might find something useful in your review. But, considering that you didn't actually install the operating system you're testing, the whole exercise was nothing but a waste of time. It's misleading to present this as a review of Ubuntu 12.04. It's misleading to quote the RAM usage of a LiveCD as though it was a relevant statistic. You are, of course, welcome to publish anything you like on your blog. It's just unfortunate that you were presented by Google as having written something useful and relevant. I will call it more like a Highway to Hell!! I tried to use Unity on my day to day laptops, both work and home, but can't get used to it, having a lot of windows of PDF, Libreoffice files, Bricscad it's impossible to be done. Beside that it's slow, veryyyyyyyy sssslllllooowww. I've changed to Mint Debian and XFCE, lighting fast. However I may say that for a common user, for browsing, email, and writing a letter should be good and also good looking. Thank you for the review! But this is my opinion, and yes it's better then previous releases, but not enough for me. Yes, every system and every DE has its own people who like and dislike it. That's life. My Unity is reeeaaallyyy faaaasstt on NVIDIA..
My self personally, I haven't had issues with work flow. I have dual monitors setup and I write software 10 hours a day. Tons of windows open (too many sometimes :) ) and thanks to all the neat keyboard shortcuts it's helped me manage my mess. I know other devs in my office have had great success as well. I think the vast majority run Ubuntu, some Suse with KDE. Honestly, I don't think Unity is worlds apart from Gnome 2. You have bar at the top of the screen with indicators and time. Then you have a task bar, but instead of being on the bottom it's on the side. I can't figure out how to put icons on to the desktop in Ubuntu 12.04. Can someone explain the method to me. You need to find an object which you'd like to link to. Right click on it, then select "Link". The shortcut (link) will appear in the same folder. Copy&paste or drag&drop it onto the desktop. Is it what you asked for? "There is no menu in Ubuntu 12.04 as most of us used to see it in the last 15 or so years"
Well, Linux will be 21 years old on August 25th of this year. But, the first edition of Ubuntu came out in October 2004. So, Ubuntu is only seven and a half years old now. I edited that fragment a little. I hope that's better. even if 12.04 lts is slow, why not wait for the super os version on the torrents sites? super os gives more tweakability and is much faster than the regular desktop versions on some computers. "even if 12.04 lts is slow, why not wait for the super os version on the torrents sites?" Thanks, Darrel for givingthe answer before I did. You're right: nothing stops me from reviewing both systems. Each of the reviews, I hope, will find happy readers. "There are too many mouse movements required to start an application." I don't follow you here; what are you referring to? It takes me one click, unless I'm doing something that I don't commonly do. I put my usual programs in the launcher. Even if they are in a different workspace, one click goes to them. >unless I'm doing something that I don't commonly do. That's exactly the point. There is limited space on launcher until it becomes too obese for quick access. If you have many applications to use, or use some of them from time to time, then navigation through the menu is not the most convenient thing in Unity. Of course, this is only IMHO. I don't mind if you have different opinion. EXTERNAL HARD-DRIVE READ/WRITE/EXE permissions are by far the most concerning factor than weather or not any one likes unity. i simply can't run programs or game exe stored on my external storage drives since 10.10- it is a horrible arrangement that MUST BE REVOKED. a live usb is a very practical setup if you could execute your larger files without dragging them on to the desktop first- and no solutions to cure this sad arrangement are comprehensible for basic users like myself. if ubuntu is to be more popular it needs to get rid of this cookie-jar access trap. Have you filed a bug report about this? Another point made above is just how messy the launcher can get after subsequent use. gnome 2 was perfect- plenty of file/page access points, all of which could be hidden with the slider buttons. SOLUTION: what is needed is a dedicated access panel for the app/places drop listings gnome 2 had. all it has to be is this 'thingy' on the desktop- a simple icon that can be moved as desired about the desktop that opens out the panel selections. you could 'customise the icon, or configure the panel text arrangement so it could drop down/out in classic style or rotate outwards circulating the icon etc. better yet- make it a desktop 'pet' that can wonder about and perform cute animations contextually- like waving for attention when a warning appears or blowing the rubbish bin with a bazooka when you delete stuff- allow the user to replace/add their own animation sets and unity will have solved its desktop access bottle neck but also given the user some desperately needed toys to customize too. That may be an interesting idea, but not for Canonical itself. Maybe someone with love to desktop animations can create an add-on. The only problem I still have with 12.04 is that Screenlets don't work anymore. I can't get a clock on the desktop and sysmonitor errors on every boot. Have you tried any of those? Thanks for the review. I'm currently using Ubuntu 12.04 on my HP Mini netbook, and it runs smoothly. All hardwares and peripherals are perfectly detected. It really amazed me to know that I could easily connect to a wireless network. Even I could easily connect it to my Android phone. today I tried the Live CD option on a rather old PC and was VERY disappointed about the performance. You're right, Ubuntu 12.04 with Unity is not for low-spec computers. If you have one, you'd better stick to something less resource hungry, like Xubuntu or Lubuntu. and thank you for the reply, DarkDuck. Today I tested the Live CD again on a quad-core 3.4 GHz PC and besides the booting I can confirm it performs really well. Putting that Live CD on a Stick will speed up booting too, so that should be something to take with me "on the road" (as long as I don't travel with my old notebook). Earlier versions of Ubuntu (at least up to Intrepid) were always quite fast even on old hardware, and my mistake was to expect this also for the newer versions. That's because Unity is more resource-hungry than GNOME 2. I get that at Tesco's. That is why I don-t shop there. But, Precise Paddling is so much more than that. 12.04 has had it's day in the sun and it is over. I would not say it is slow - it is ponderous. It is all about a bunch of programmers attempting to deny the existence of cracks in their arses. From Lucid Linux to this, is probably akin to stepping into a black hole (although I cannot speak from personal experience). It lasted no more than two days on my nettop. I then discovered Maya - which does everything Linux says it is supposed to do. If I was the boss I would sack all the wankers that produced this ponderous crap and boost 10.04 instead. And don't tell me that I can change this and that. Those dickheads should have worked this out in advance. Just because it is free does not inherently imply that it is also any good. And because it is free you feel inhibited enough to justify criticising other cons criticism. Currently, it's Xubuntu 12.04. I don't know about 12.04 with Unity now--one of my machines likely is good enough to do better with it, but, haven't the developers of Ubuntu sailed off of the edge of the earth?! I started out with Redhat CDs long ago (when Redhat was still "free"): I was impressed, but, of course, it couldn't do many things then--a lot of incompatibility: Fedora is too hard to configure for real life, and I hate RPMs. Maybe Debian is fine (given that one doesn't have to resort to ordering CDs--or Jigdo, and cruddy mirrors). Is anyone "in charge" of distributing Debian wisely, now? It's been years since I've fooled with things at this level and checked alternatives out--does FreeBSD still live? I'll find out! He, he! Hi, I believe you can find on this blog the reviews of different distros you mentioned in your comment:BSD, Fedora, Xubuntu, Kubuntu, Debian. As for me, I have Mageia, Xubuntu and Debian running on my laptop. It depends on requirements and my feelings which system I use today. Today is Xubuntu's day. As for Debian, you don't need lots of CDs if you have an internet connection. You can start with CD #1, or Live Debian CD, or even with a barebones netinstall, and then download the components you need. If you still want a CD, or many Debian CDs, then buylinuxcds.co.uk is your choice! There's no Debian in the list, but you still can ask via the contact form!